My point is that eco-design thinking, as described in this column, is not about “going green” (headline 22-02-14) or being “eco-warriors” (headline 01-03-14). It is about recognizing and maximizing beneficial relationships within systems to develop strategies that are good for people, good for the planet, and save money. This type of holistic, win-win-win design thinking helps our family save hundreds of dollars on our power and food bills every month. It is opposite to the lose-lose-lose situation Wanganui District Council has saddled us with regarding the wastewater treatment plant: bad for people, bad for the planet, and expensive. On top of the original poor design and/or management, the finger-pointing and excuse-making, council has added insult to injury by piling on more debt by running a useless odour fence, which according to my conservative calculations will cost every household in Whanganui over $60. Thanks to Cr Vinsen and Bob Walker for questioning this grossly reductionist thinking that will likely cost over a million dollars when interest is factored in to the total cost of the fence. This would be a good time to point out to Whanganui ratepayers and voters that two large U.S. metropolitan areas have recently sought bankruptcy protection because of grossly mismanaged municipal projects. Montgomery County, Alabama, ended up over $4 billion (U.S. $) in debt because of a disastrous sewer project, while Harrisburg, Pennsylvania (the state capitol) faced over $300 million (U.S. $) of debt over a rubbish incinerator. Sadly, it appears that a long history of reductionist thinking has boxed Whanganui into a debt corner from which council sees only one escape: growth. Put another way, WDC has racked up so much debt that it would be politically unpalatable for the current ratepayers to pay it off. Indeed, my combined WDC and Horizons rates are already on track to double in about nine years. How sustainable is that? Let me make this perfectly clear: I think we should fight for every job and every dollar to stay in Whanganui, and that we should seek to create meaningful employment for those who seek it. But continued reductionist thinking is unlikely to get us there. Someone please name a city in New Zealand or a country on Earth that does not hold these exact goals? Given what appear to be misguided decisions and poor execution by WDC on a slew of issues that have appeared in the press recently, do they really think they can out-compete Palmy, New Plymouth, Hamilton, Wellington, Auckland, Christchurch, China, India, Thailand, Vietnam and Australia at the same game? 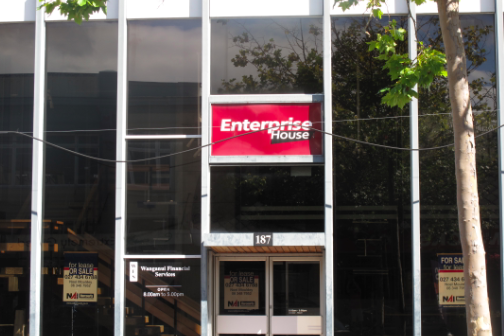 Signs of the times: Vacant “Enterprise House” on Victoria Ave.
Eco-thrifty design thinking, on the other hand, would be considered glass-half full. It seeks out and eliminates waste within systems that serve neither people nor the planet, and also waste money. A good example of this was turning off the lights in front of Central Library during daylight hours. That simple act will save ratepayers thousands of dollars in the years to come, but sadly could not save the thousands already wasted over the decades since the poorly designed system was installed. As one always willing to give credit where credit is due, I acknowledge council’s decision to dowse the light, as I also acknowledge what appears to be the holistic thinking of senior stormwater engineer, Kritzo Venter, and the foresight of Cr Visser regarding the reductionist practice of continually pushing sand to windward on Castlecliff Beach. May I suggest to my editors that I would rather see council “in the black” than “going green”, and that I’d prefer an army of “worrier warriors” in this city, because our unsustainable debt load is very scary.